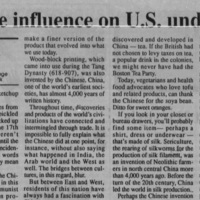 Op-Ed "Chinese influence on U.S. undervalued"
This Op-Ed was published in The Collegian in 1989 and was written by Dinah Eng of USAToday and Apple College Information Network. It does not note whether or not if Eng is a student at the University of Richmond. In her piece, Eng argues that the influence of Chinese culture in the U.S. has been largely ignored. She brings up several Chinese inventions that have huge importance in the U.S. -- and other Western cultures: ketchup, paper, gunpowder, silk, seismographs, and more. Eng argues that Americans have romanticised China and portrayed it in Hollywood and stereotypical, and sometimes offensive, ways. She concludes her piece with a quote, "But the Chinese who came to this country are extremely hardworking people. They've truly added a spice to the melting pot we call America." 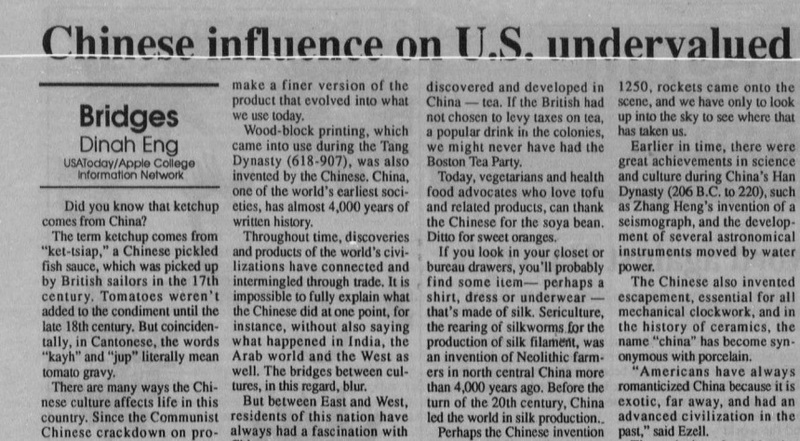 Eng, Dinah, “Op-Ed "Chinese influence on U.S. undervalued",” Race & Racism at the University of Richmond, accessed April 18, 2019, https://memory.richmond.edu/items/show/1632.